Releasing a list of 30 “big reforms” that the Modi government was supposed to undertake when it took office in May 2014, in a status report card, the Center for Strategic and International Studies (CSIS), a bipartisan, nonprofit thinktank headquartered in Washington, D.C., has found that in just six of them it has succeeded in moving forward, while in 11 there has not been any progress, and in 13 there has been only a partial movement. The six main Modi’s “successes”, the thinktank notes, three are relate to attracting foreign direct investment (FDI). These include included relaxing rules for allowing foreign investment in construction projects; allowing more than 50 per cent foreign investment in Indian railways; and fully opening the coal mining sector to private/foreign investment. The other “successes” the thinktank notes are conducting “transparent auctions” of telecom spectrum; deregulating diesel pricing to “lower government subsidies” and “encourage” expansion of private hydrocarbon production; and extending the expiration date of industrial licenses from two to seven years. Then the government failed to “remove government-mandated minimum prices for agricultural goods”; to allow cities to issue municipal bonds to raise funds; to allow foreign lawyers to practice in India; creating a unified national tax on goods and services tax (GST); and make it quicker and easier for companies to go through bankruptcy. Similarly, there was partial success in allowing “more than 50% foreign investment in direct retail ecommerce”, as the “sector is still closed to FDI when companies sell directly to consumers”; in allowing insurance; deregulating natural gas pricing; ending retrospective taxation of crossborder investments; making it easier for states to use eminent domain to purchase land; reduce restrictions on foreign investment in multi-brand retail FDI; stop forcing banks to lend to “priority sectors”; and transfer to deliver cash subsidies through direct cash payments of subsidies. The linked document, provides a different perspective than the headline. Foremost, looks like the Think Tank has decided the parameters against which to measure the government. For example one of the parameter is 'Reduce restrictions on foreign investment in multi-brand retail'. Now BJP has clearly stated they won't to do this, so not sure if this should be a parameter. Another one is removal of 'minimum support price' for agri goods. That's also not going to happen. But be that as it may. They must have their own methodologies to measure. 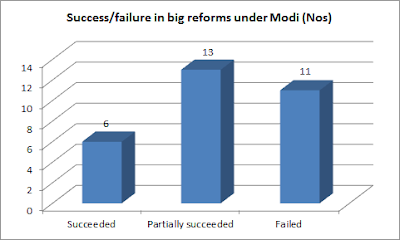 Now out of 30 reforms, they have succeed on 6. On 13 others, the have made 'partial progress', which to me looks great and 'can' be added to the success list. For example in defense and insurance they have increased the FDI limit to 49%, but the think tank expects 50%+. The other partial one is natural gas pricing, where the think tank seems to be pretty happy with the progress. The progress is also being made on financial regulation, DBT, retrospective taxation, priority sector lending (listed as partial where they acknowledge good progress). So that's 19 out of 30, where they have carried out reforms or it's work-in-progress. That leaves 11. Out of which some are suspect cases like allowing foreign lawyers to work in India. The other one is GST, which will happen sooner or later. From what's left, where they say the progress isn't there is ease of doing business (that's like 4-5 parameters of 11 where the govt has failed). In total, they actually rate the government better than even the most BJP supporters would do.